A fairly ambiguous statement, Soil Treatment, yet again in the contaminated land remediation world we have tried to claim it for our own (Please don’t tell the farmers and gardeners out there). Contaminated soil treatment has 2 main applications, in-situ and ex-situ, the target being to reduce / remove contaminants in order to either facilitate safe re-use on site, or dispose of the materials off-site at a cheaper rate. Ex-situ soil treatment can be done on-site if you have the time and space, or the increasingly popular option is to send soils to one of many soil treatment centres across the UK. Soil treatment centres are designed to reduce the soil contaminants to a level where the soils are suitable for re-use. The important point with treatment centres is that the soils are not landfilled and therefore no landfill tax is levied (click here to see the government landfill tax escalator (currently 86.10 / tonne as of April 2017). 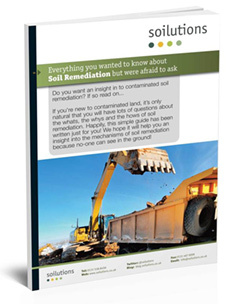 Soil treatment, in any guise, is an excellent addition to a remedial options assessment.